c/o Florence International Meeting Organizer s.r.l. 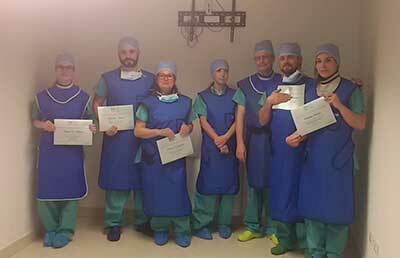 Pictured from left to right are: Dr. Carla Di Martino (Mestre) – Dr. Gianluca Agresta (Varese) – Dr. Renata Di Gregorio (Benevento) – Dr. Genni Duse (Padova) – Dr. Alessandro Dario (Varese) – Dr. Dario Tammaro (Napes) – Dr. Elisabetta Saracco (Naples). The participants completed the course at the ICLO Teaching Research Center in Arezzo, Italy.